Simple Business Directory Pro is a unique and Multi-Purpose Directory WordPress plugin for One Page Business Directory with Maps, Staff Directory, Employee Directory, Vendors Directory, Restaurant Directory, Company Directory for Intranet and more. Create innovative and elegant Business Directory on your WordPress website in a matter of minutes with Google Maps, Upvote, Embed, Front End User Dashboard and more! Turn your website into an community driven Authority by curating niche specific useful Business directories that your users will love, bookmark, embed and share! Forget those old style boring directory styles and layouts. This innovative and powerful, yet Simple Business Directory WordPress PlugIn allows you to create and curate comprehensive Business Listings and Map Directories with detailed business information and Tap to Call feature with ease. Simple Business Directory can also be used for your company staff directory for the Internet or Intranet. Use staff or employee details like image, designation, address (optional), social media profile links to build the employee database and choose one of the 10 templates to display them in an incredible, searchable, shareable format. You can also use this flexible plugin as a Church Members Directory or Organization Directory of any type. Are you a company with a large number of vendors or partner shops spread across the country or globe? Simple Business Directory can work as an efficient Vendors Directory plugin to list them in a user-friendly manner and make all the locations instantly searchable. This multipurpose map directory plugin can be used as a store locator, dealer locator or store finder and help your customers find your retailers. It has all the features you need to create an instant searchable store location finder on your website. Whether you have ten locations or 1000, you can manage them efficiently with Simple Business Directory. There is no special programming or extra setup required. SBD comes with the opportunity to Monetize your business directory. start making money with your WordPress website! It is an extremely easy and super quick process. 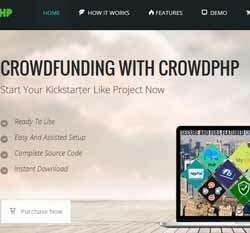 You can literally set up a quality money earning website under 48 hours with this fabulous WordPress Business Directory Plugin. Simple Link Directory Pro comes packed with 10 fully responsive and innovative templates. We are working on more beautiful templates. If you are a blogger, webmaster, seo specialist or marketer this powerful Link Manager is an indispensable plugin for you! Getting up and running with Simple Business Directory could not be any easier – yet it packs all the advanced features for a power user! 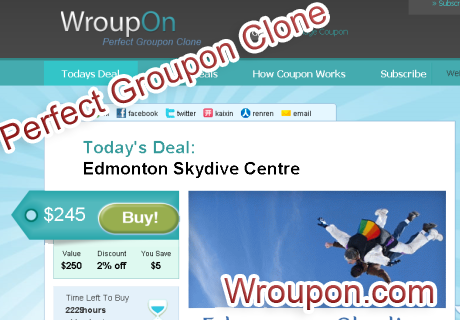 Choose a business niche you want to curate business listings for. Create a Category for that topic inside Simple Business Directory. Categories help you organize your Link Lists in the backend and easily show them on any page. A List is comprised of many business listings. Each list entry can have an image (usually site logo), site URL, a short description, phone number, full address, facebook, yelp, twitter links etc. You can add as many links under one list as you want. If you want to show only a few links then one list is enough. But SBD shines when you create multiple Lists with 10-20 listings under each and assign all lists on the same topic to the same category. Go to any existing page/post or create a new page/post from WordPress backend. 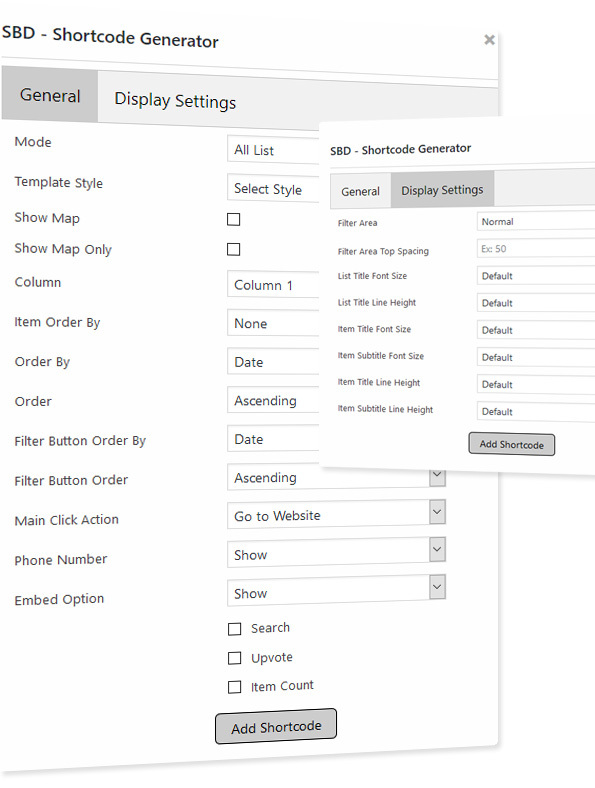 Open the [SBD] shortcode generator from your visual editor, choose your options, generate the shortcode and publish. Voila, your business directory is now live with a gorgeous looking template. The plugin is under active development. 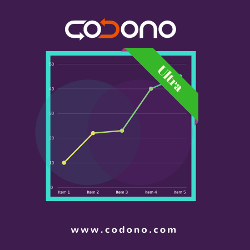 We want to work with you as we expand the plugin features so it becomes truly useful to you. If you have any feature request, let us know in the comments. We will try our very best to accommodate all reasonable feature requests. 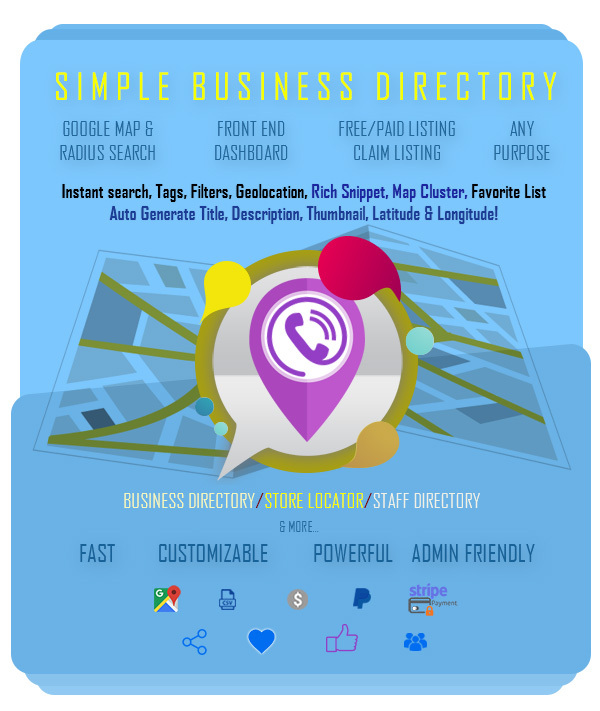 Why Simple Business Directory Pro? 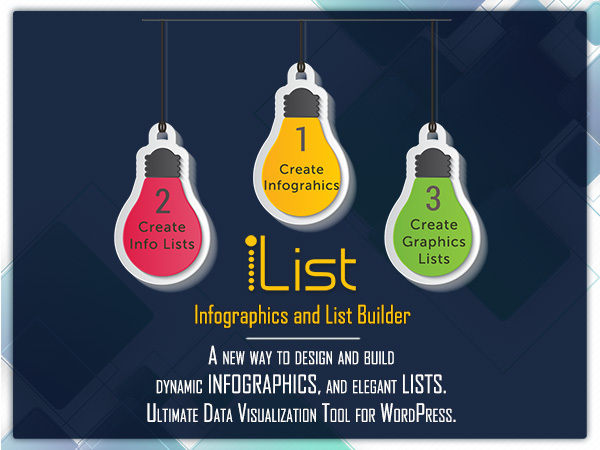 If you like Simple Business Directory – you may also like our Infographic and List Builder for WordPress plugin iList.